The 10th episode of Pirates largely focuses on the Bentenmaru’s quest to find the Serenity ghost ship. 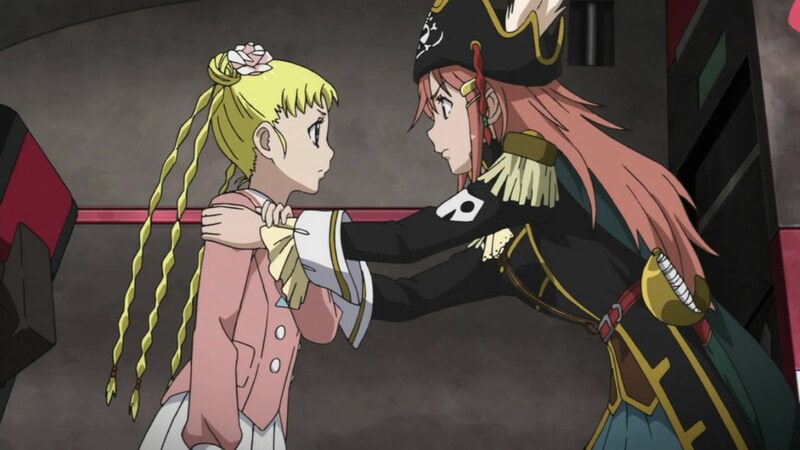 In the meantime, Chiaki is given a crack at piracy as cover for what Marika was really doing. Marika learns a bit more about how the ship manages to function when she isn’t there. 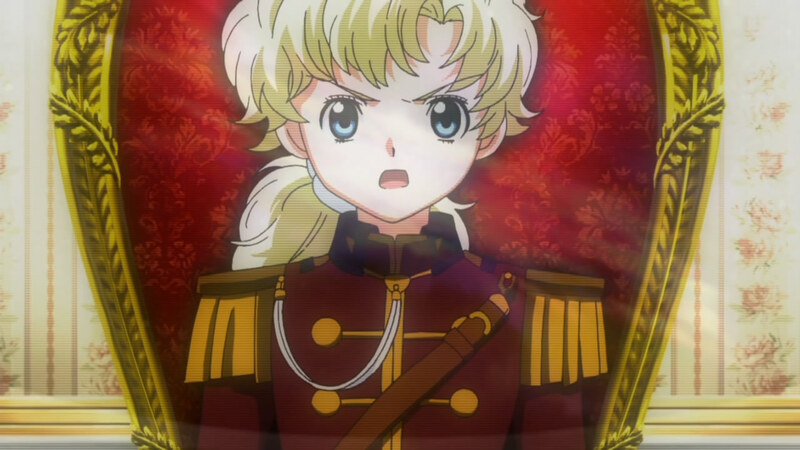 Finally, she begins to make decisive choices as captain when faced with the prospect of real combat for the first time. How could someone not want their insured valuable merchandise taken by someone like this? The great diversion at the beginning of the episode provides both a plot point as well as appeasing fans who wanted to see what Chiaki would be like as a captain. She’s there basically to serve as the diversion while Marika is away. 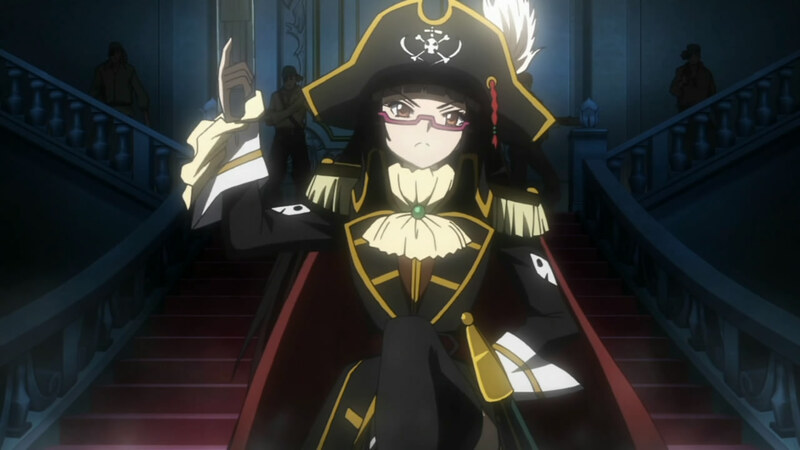 Marika as a captain isn’t well known enough to have the public at large know what she looks like, unlike say her mother who happened to be the last famous female pirate. This means Chiaki can go around wearing the outfit and impersonating Marika without much consequence. This was actually a well done twist on what the preview implied was happening. Also, there was the startling revelation regarding Gruier and this particular ghost ship. Coorie simply had to input Gruier’s name and biometric data and she had access to the beacons to track the ghost ship. What was surprising was that the beacons were older than Gruier. This really struck at the very core of Serenity’s royal family. In order to maintain their independence, it appears that they went for cloning rather than mixing with outsiders. That they continue this more than 100 years after war poses an interesting statement that I hope this series addresses in the near future. 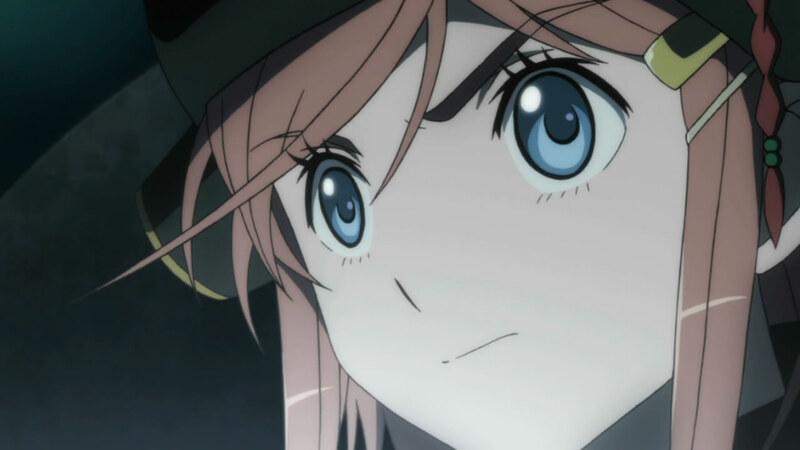 Finally, we get a look at Marika’s captain skills in a life-or-death situation as she transitions from the relative safety of electronic warfare to ship-to-ship warfare. The simple fact is that she was able to make decisions that kept them safe and worked toward their longer term goal of finding the ghost ship. As just one ship on it’s own, the Bentenmaru’s goal is to avoid being detected. When that wasn’t working, Marika made the logical decision to go after the smallest group of Imperial ships and employed a tactic designed to let them get away quickly and go back into hiding. You don't have to worry about trying to issue orders, that's my job. These were decisions that were made remarkably quick. No one on the crew had problems with these orders and they executed them brilliantly. 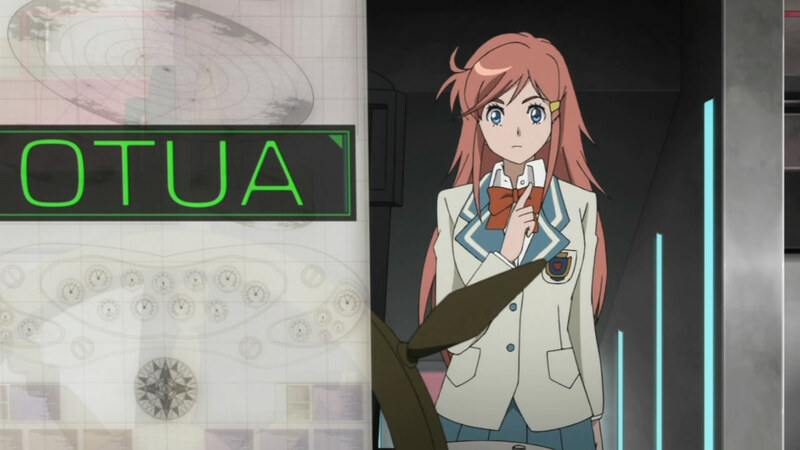 Gruier’s presence on the bridge served as a way to show what dangers were posed by this strategy, but they also served as a way of showing Marika’s full strategic understanding. To have Gruier attempt to stop the ships from Serenity would have been the easy way out. There was no guarantee it would have even worked either. That’s another sign of a good captain; only utilizing the resources she needs to get the job done. And now we have Gruier in an alternate costume and hairstyle. I bet that DLC costs a bit of change. 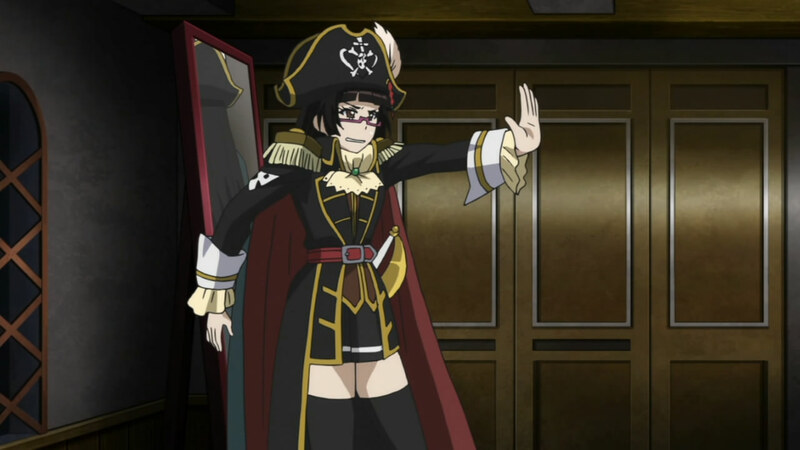 Elsewhere in this episode we had Chiaki breaking the fourth wall while admiring how she looked in the pirate outfit. Sandaime showed that even experienced pirates still get anxious in battle, however he was calm while Marika was giving orders. It also looks like next week we get not one, but 2 Gruiers. That should raise all manner of questions. Marika is starting to show her stuff but it has to be said that Chiaki has a much better handle on the pirate laugh and demeanour. This episode was fine and I enjoyed the action, but I do hope they slowly start answering some questions about the strange behaviour of the Serenity royal family and fleet. It seems strange that seasoned pirates would accept this job without having more information, specially considering the odds they’re facing. Not to mention the fact that in the intro’s they keep mentioning the Galactic Empire, which points to them being a player at some point. I think there’s actually a difference in the roles they are playing. Chiaki is playing the role of pirate and Marika is playing the role of captain. As far as accepting the job, I think there’s probably a good financial reason they took this job on. The Galactic Empire has already come into play as I believe Serenity is part of the Empire, but still semi-autonomous. I’m starting to have some doubts about the subs in the version I’m watching. I feel like I’m not getting some of this background info (Serenity being part of the Empire for example). I think it was mentioned in the opening narration to episode 8. My favorite episode to date. The series is really beginning to find its feet now. 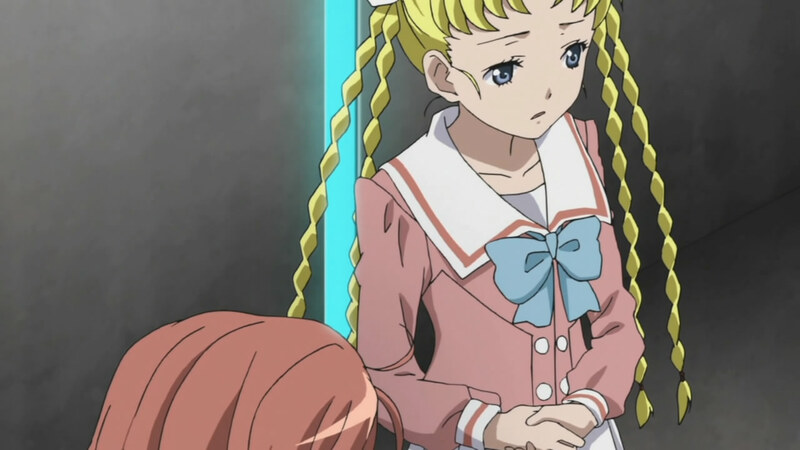 According to the official website (and the usual folk in Animesuki who read the novels) that isn’t a clone at all, but Gruier’s younger sister, Grueinhild, who’s (get ready for this) ten years old. She’s listed as the 8th princess (Gruier is the 7th). I don’t think that really rules out cloning though, even if she has a different name and is younger. Nessa loves love! Nessa hates hate! Nessa has orange hair and Phryne has purple hair even though they’re clones of the same person who had black hair! Chiaki isn’t that bad, and Fractale is only the 3rd worst Noitamina show now.